The Haunted Park celebrating its 31st Halloween in 2017. For over three decades, during the final days of October, Westchester Recreation Park has transformed itself into a terrifying Halloween event. 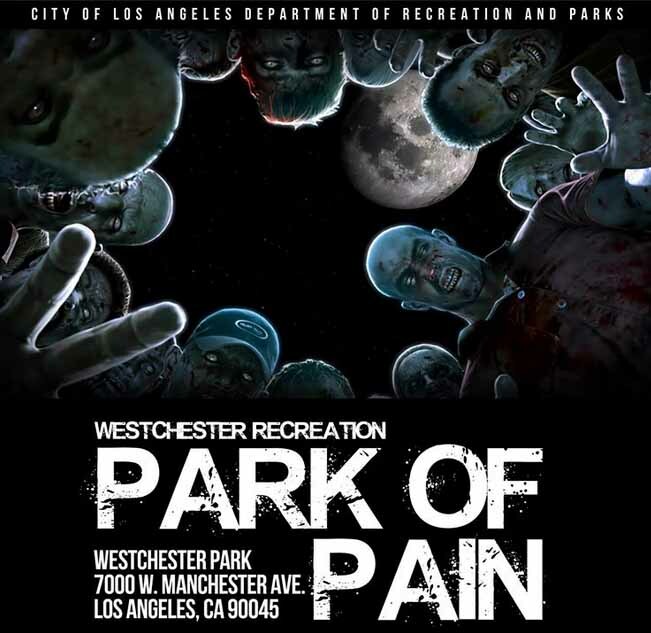 Originally calling itself "Westchester Haunted Park"- before switching to "Park of Pain," the attraction features two mazes, set up inside a gymnasium. Geared for local trick-or-treaters: the settings are fairly simple, but the mazes are lengthy; the monsters are not too scary for the youngsters, but they make an effort to put on a good spook-show that will work for the whole family. The event is recommend for adults and children 7 years and older. The Halloween Kids Zone is for younger children. The afternoon event includes "carnival style" games, face painting, a trick or treat village, scary stories, a costume contest, and more. Admission is free. Click to reach Hollywood Gothique's review.